The differential housing (4010) consists of a cast aluminum housing and a cast aluminum differential housing cover (4033). The differential housing cover uses silicone sealant as a gasket. The hypoid-design gearset consists of a 8.8-inch differential ring gear and a drive pinion gear. 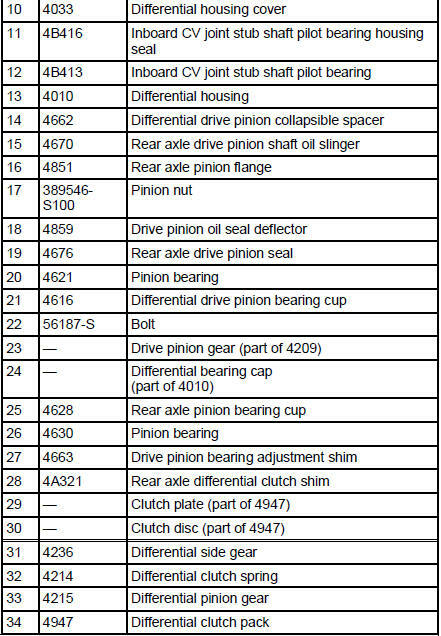 Two opposed pinion bearings (4621) (4630) support the drive pinion gear in the differential housing. A differential drive pinion collapsible spacer (4662), located on the drive pinion gear shaft, maintains pinion bearing preload. The pinion nut adjusts the preload. Differential bearing shims (4067), located between the differential bearing cups (4222) and the differential housing, adjust the differential ring gear backlash and the differential bearing preload. The differential case (4204) is a one-piece design with two openings to allow for assembly of the internal components and lubricant flow. Two opposed differential bearings (4221) support the differential case in the differential housing. Removable differential bearing caps retain the differential assembly in the differential housing. Inside the differential case, the differential pinion shaft (4211) supports two differential pinion gears (4215). The pinion gears engage the differential side gears (4236), to which the halfshafts are splined. 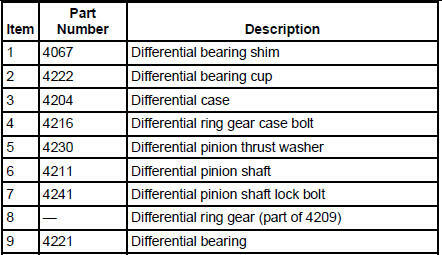 The differential pinion shaft lock bolt retains the differential pinion shaft in the differential case. A circlip, located on the inboard CV joint stub shaft, holds the halfshaft in the differential case. When installed, the circlip engages a groove in the differential side gear. The rear axle uses SAE 75W-140 High Performance Rear Axle Lubricant F1TZ-19580-B or equivalent meeting Ford specification WSL-M2C192-A.